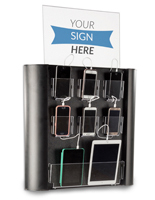 Looking for a way to add value to customer waiting rooms, lobbies, or client service areas? Our docking charger stations are designed to offer free battery recharging for multiple devices, including cell phones, tablets, e-readers, and even laptops. 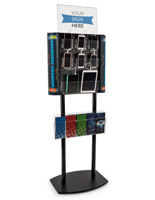 Thse kiosks, countertop displays, and wall-mounted charging stands come in a variety of styles to match commercial, professional, hospitality, and retail business needs. 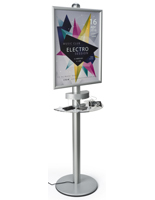 Branded docking charger stations are a great way to add value to customer waiting rooms, lobbies, terminal or concourse areas, and showrooms. 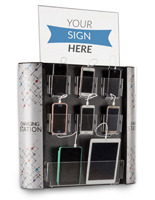 Handheld phones, iPads, e-readers, and tablets are a part of everyday life for most people. 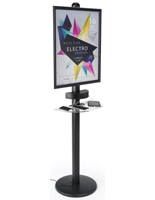 Free access docking charger stations, also known as multi-device charging kiosks, offer a necessary service to customers, clients, visitors, guests, and employees that is guaranteed to keep them in place for the duration of the charge period. These tablet, phone and iPad power-up fixtures that incorporate signage, brochure holders, or brand messaging are an ideal way to increase visibility or up-sell services in a helpful, engaging way that adds value to the customer experience in any environment, from offices to public areas to trade show booths. 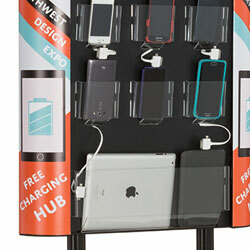 What multi-device charging kiosk designs are available? 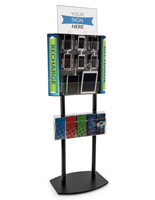 Freestanding docking charger stations offer pre-installed 3-headed charging cables that each have lightning, micro-USB, and traditional 30-pin Apple® heads. 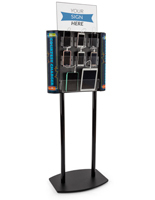 A variety of clear acrylic pockets allows the stand to accommodate various device sizes, from iPhones and Android mobile devices to iPads, tablets, and e-readers. 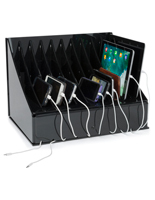 Optional base accessories include slide in header frames and brochure pockets. 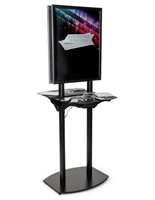 Side graphics are available with a variety of stock or custom printed branding or advertising messages. 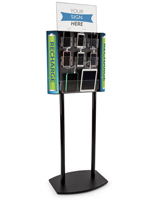 Wall charging kiosks are designed for busy environments with limited floor space. 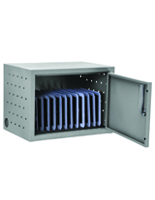 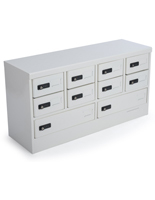 These versatile, easy-to-install racks can also be ordered in a number of configurations. 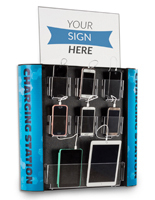 Slide-in clear acrylic frames for headers or messaging and side graphics in stock or custom designs allow these charger stations to be customized to any environment. 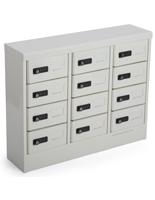 Multi-device recharging and storage lockers offer convenient power replenishment in individually locking compartments. 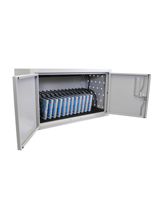 Designed for maximum security in public environments, these mobile device charging cabinets incorporate combination locks that are easily reset as needed using the included master key. 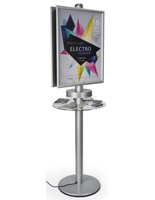 Use of this style fixture can be offered to customers as a free or a paid add-on service as desired, adding a potential revenue stream to many businesses. Portable clamp-on tablet displays with integrated power resupply combine the convenience of a charger station with the functionality of a workstation. 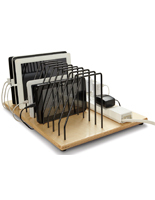 These easily portable stands have universal-style lipped holders that easily accommodate mobile phones, tablets, e-readers, and other equipment as needed. 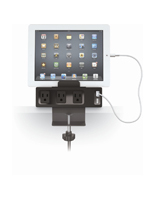 Commercial quality iPad charger stations are designed to withstand use in public environments. 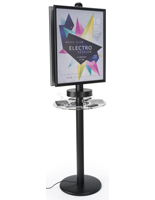 These versatile fixtures accommodate use as courtesy offerings to waiting customers, patrons, or visitors in restaurants, retail stores, waiting rooms and terminals, concourses, and office enviornments. 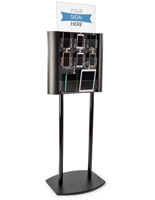 Freestanding floor stands, space-saving wall-mounts, and individually locking countertop cabinets all allow professional, commercial, and hospitality industry businesses to provide a free service that any mobile technology user can easily take advantage of. 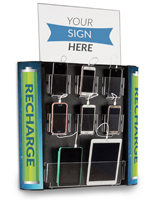 These versatile recharge banks are designed to hold multiple devices, and offer ample options for advertising, marketing, and sales messaging to customers, patrons, and visitors using the devices.